A recent project was to repair a fiberglass Jeep hood did not fit the vehicle. The center of the hood did not match the shape of the cowl as it originally did when it was manufactured around 15 years ago. The hood was structurally sound, but out of shape where it was supposed to match to the rest of the vehicle. A fix was required. The hood, fenders, and grille were molded into a one-piece assembly. This hood was designed with structural geometry around the rear perimeter on the back side of the edge where the painted hood met the vehicle. A wide rib constructed with fiberglass-encapsulated balsa core was the original design. Over time, this structure had not done its’ job and had allowed the hood to deform. The plan was to rework this geometry and move this surface of the hood back into the original shape to match the surfaces of the rest of the vehicle. 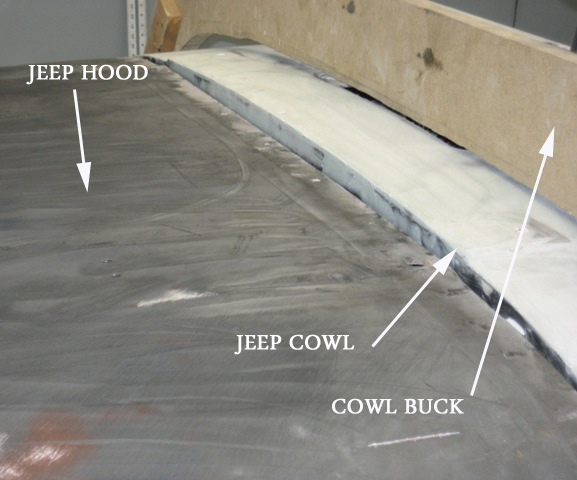 The Jeep was being repainted, and the following photo shows the hood compared to the top of the cowl. There was also some mis-alignment on the sides that is not shown. A wooden buck was made to follow the shape of the cowl. This wooden piece was cut to fit the cowl shape and allow this shape to be transferred over to the fiberglass hood. It was also relieved an extra 1/4 inch in the center. 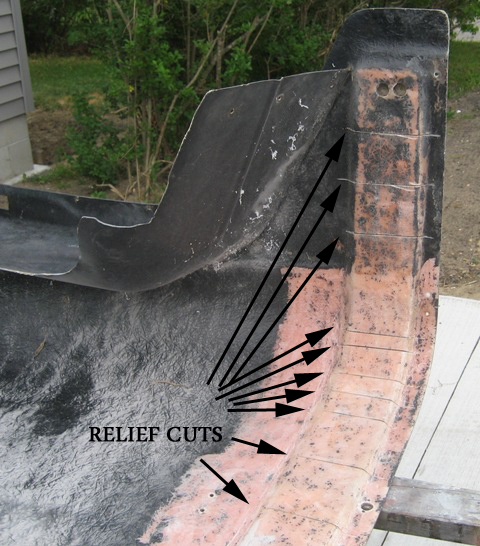 This would allow the fiberglass hood to shrink back down a bit as the fiberglass resin cured. The installed hood is always fighting gravity, so extra allowance was made for the hood to relax back down. The next move was to loosen up the hood substructure. This was accomplished by sawing into the support structure in several areas that needed to move to allow the hood surface to conform to the wooden buck. The relief cuts were made at the same time that the surface was prepped for resin by lightly grinding to remove paint and contamination. This work creates lots of dust, which must be removed before the resin is applied to the hood. The cowl buck was then installed on the hood, and screws were installed into the wood to hold the shape of the hood where it needed to be. These screws were tightened gradually so that none of the areas of the hood would be distorted and cracked. Now we are ready for the resin. 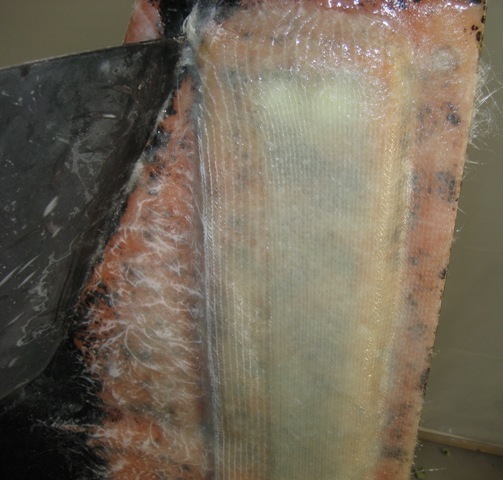 Epoxy resin works well for repair such as this, and we had some West System available for this project. The reinforcements were regular glass -boat cloth, 1708, and 1-1/2 ounce random mat. The first layer of glass on this project was kept back away from the screws and mainly was used to close in the relief cuts. Then a layer of 1708 was added on top of that for additional strength and mass. Once it was cured, it was sanded for the next layer. The screws were removed and the cowl buck came away free. The test-fit was successful. The top side of the hood was treated to some pieces of tape over the screw holes. This would keep the resin from coming onto the top surface. 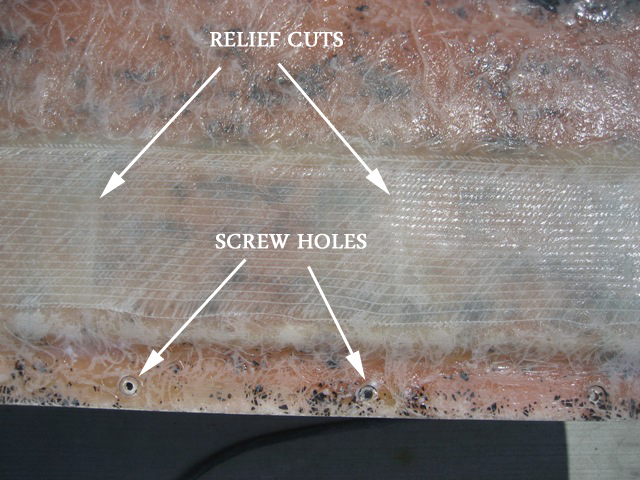 The tape would be easily removed when the resin is cured. The holes were filled by first wetting the surface with epoxy resin, then filling them with thickened epoxy resin. The West system has a product that is available to make a putty-like epoxy mixture to use as a filler. 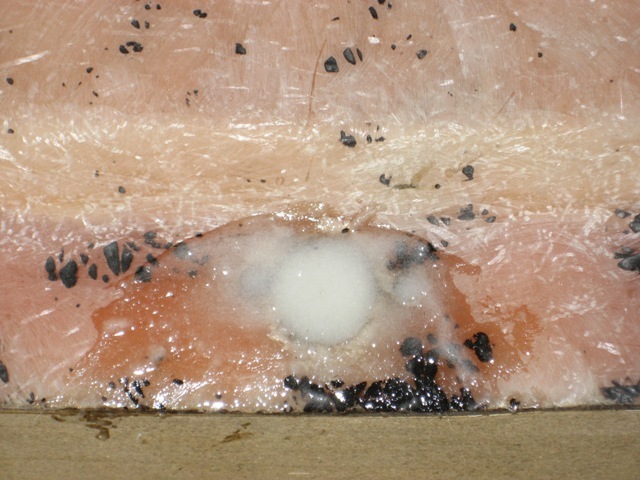 This putty is applied and immediately followed with the application of a layer of glass. There are a couple of reasons for this. Firstly the bond between the putty and the reinforcement is superior when it is allowed to cure at the same time. Secondly, it saves time and labor from having to wait for the putty to cure, and then sand it for a flat surface. 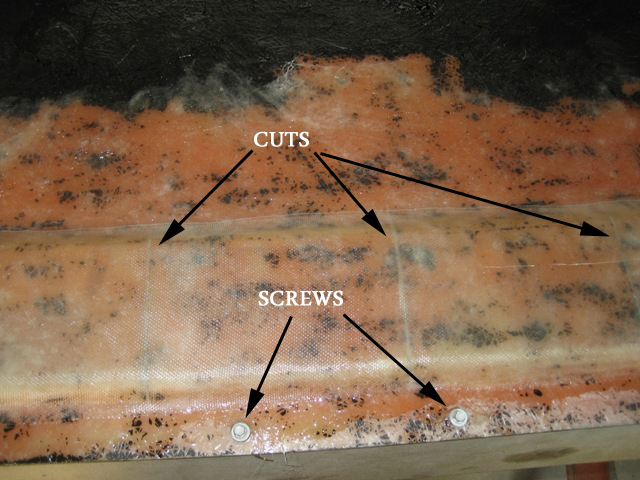 This photo shows the last layer of 1708 fiberglass reinforcement covering all of the screw holes and adding more structural integrity to the bottom structure of the hood. Also note the use of offset reinforcement lines. This will help prevent laminate failure. That wraps up the repair of the hood. The shape is restored to original, of course depending upon how accurate the wooden cowl buck is shaped. This project took several steps and required several cure times in the process. 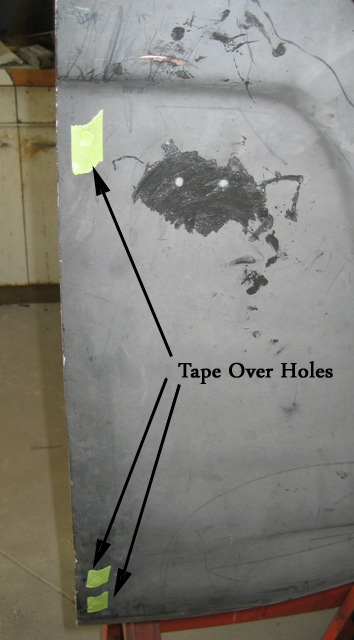 Overall, it should be a durable repair that should stand the test of time. That is a great post. 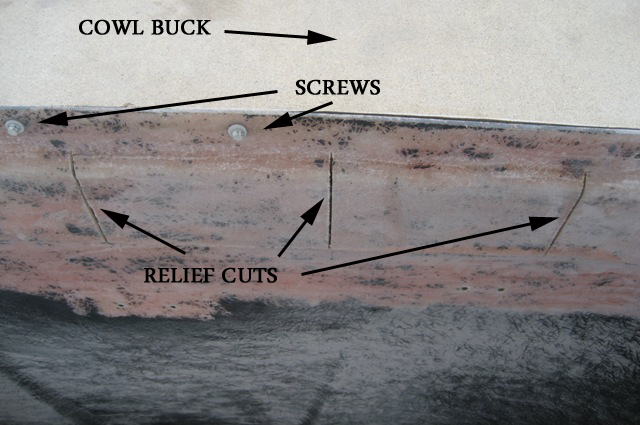 I really appreciate the detailed explanation on repairing the jeep with fiberglass filament.As fiberglass is light and extremely strong it comes in handy with procedures like this.